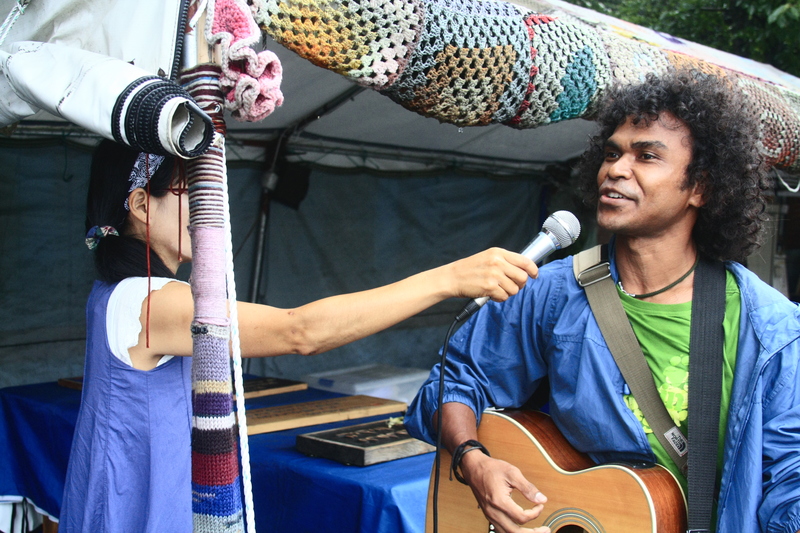 Peace for the Sea International Peace Camp, aimed to build up the inter-island solidarity for peace among three islands, Okinawa, Taiwan, and Jeju, in East Asia has been successfully held from Aug 3rd to 6th in Gangjeong village, Jeju Island with around 50 participants from Indonesia, Hawaii, Australia, New Zealand, Japan, Spain, Unites States, Korea, not to mention Okinawa, Taiwan, and Jeju. 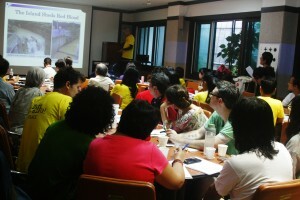 On Aug 3rd, participants visited Jeju 43 Peace Park to get the basic introduction of the traumatic history of Jeju island. Participation in the Human Chain activity and sing the beautiful songs by Peace Camp participants. On the morning secession from Aug 4th-6th, people learned and exchanged the different stories on Okinawa, Jeju, and Taiwan following the different topics on each days. Every day, the presenters from Okinawa, Taiwan and Jeju brought us their different but connected island stories. And in the last day, we even have the Peace activist from Hawaii to present one of the most representative case of the evilness of the US militarism in Hawaii. And through the volunteering discussion in the late night of Aug 5th and part of the time in morning secession on Aug 6th, the peace camp participants made the common statement and presented it in Japanese, Chinese, Korean, and English language in the press conference during the Daily Human Chain Time in front of the Naval Base Construction gate with the shouting in 4 languages of NO Base, No Violence, No Killing, No War, No Nukes, No Destruction of Nature. The following is the statement by the Peace Camp participants. 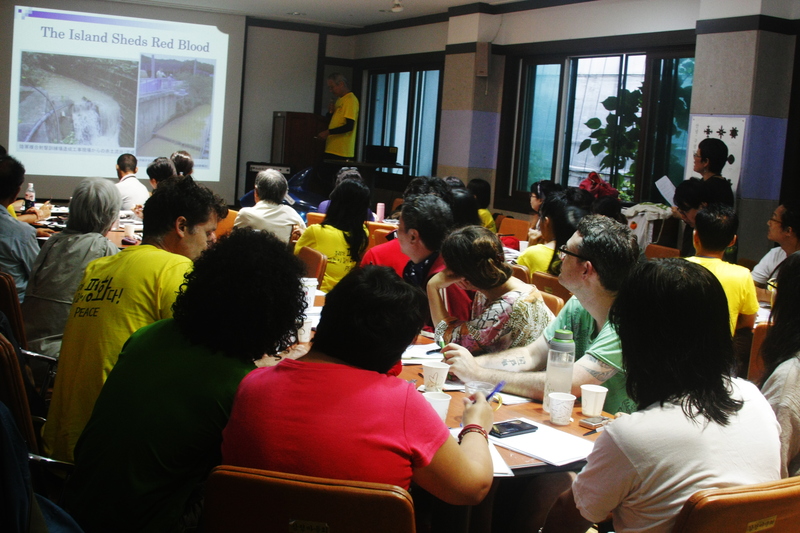 We have gathered here in Gangjeong Village as witnesses of conscience who have also formed new bonds of friendship. 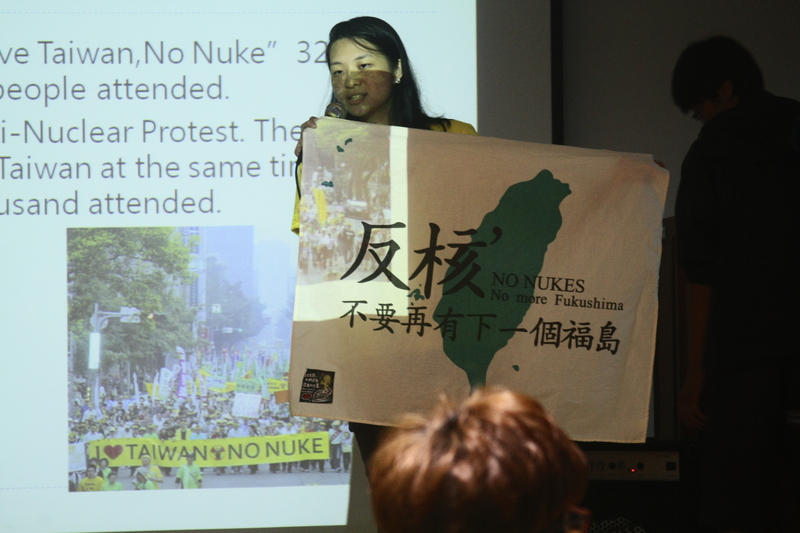 We are peacemakers from across four different continents who have gathered to help promote inter-island solidarity among Okinawa, Taiwan, and Jeju. As part of our “Peace for the Sea” International Peace Camp, we feel moved to join together to issue this statement of solidarity. We believe that the building of this naval base is wrong and a clear violation of local and international law. 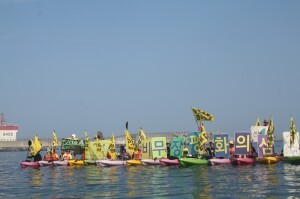 As members of the global community who love Korea, we are appalled that the construction of this naval base is poised to destroy the fragile ecology of an island renowned throughout the world for its natural beauty and geological significance. 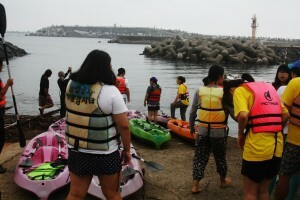 The projected impact of this base would forever change the character of the island and could potentially cripple Jeju’s thriving tourist economy. We emphasize in the strongest terms that militarizing this island stands to ruin Jeju’s pristine environment with toxic pollution, and would dishonor the island’s character as a sacred island of peace and a place of collective healing from historical trauma. Here in Jeju, we are furthermore inspired by the courage and integrity of those who have long opposed militarism and state violence in Okinawa and Taiwan and on other islands in East Asia. We share parallel backgrounds and many common experiences, and we stand in solidarity as we engage in a common struggle against anti-democratic militarism. We also share a close kinship with the sea, and we embrace our duty to protect the right to peaceful oceans, which is our common human inheritance. We therefore challenge the manifestations of state violence on Okinawa, Taiwan and Jeju. 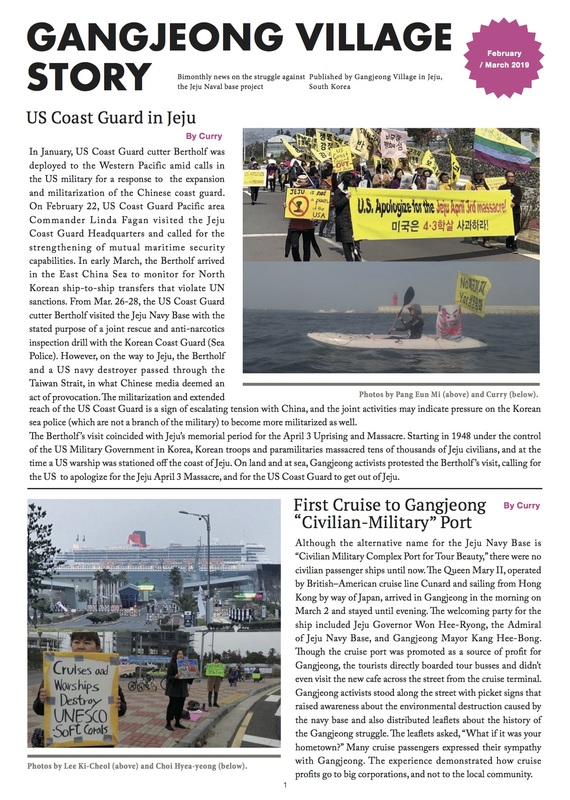 Given that reducing military tensions in Northeast Asia is essential to promoting peace throughout the world, all three islands must be demilitarized and restored to their former long-standing existence as peaceful communities at the maritime crossroads of Northeast Asia. For the sake of a more secure future in the region and for the world, we urgently call for a newly Demilitarized Peace Area without military bases in Okinawa, Taiwan and Jeju. This statement was written collaboratively among all of the participants of the International Peace Camp. In the night, the peace festivals were held. In the first day’s “Welcoming night”, Gangjeong villagers, Go, GwonIl, the vice mayor of Gangjeong, and Jeong YoungHee, the chairwoman of Gangjeong anti-base committee gave the welcoming speech to these domestic and international peace delegates. In the second day’s “Cultural Night”, people learned and enjoyed the Gangjeong, Okinawa, and Indonesia traditional dances. And in the movie night, we watched the Gangjeong documentary–“Gureombi, the Wind is blowing” and had the dialogue with Director Cho, SungBo. In the last night, the music concert was held and the closing speech had been done by the other Gangjeong vice mayor Mr. Choi, Yong-Beom and the video message from the Jeju Bishop Mr. Kang U-Il to the Peace Camp participants. Through these festival nights, people got time to exchange and share our cultures from different islands and areas and some also use this time to give the solidarity to the palatine people who is now suffering by war. All the participants in this peace camp are the precious presents who make the inter-island solidarity for peace be on the way of realization. We exchange our promise not to let one struggle alone against militarism. And the 2nd, and 3rd Peace Camp in Okinawa and Taiwan are under preparation.